But how to drop a millisecond part in every pasted string, I mean a date like ‘2006-12-24 15:35:19.658′ should be replaced with ‘2006-12-24 15:35:19’ one? Any simple Find and Replace functionality won’t help, as I don’t know what to find and with what to replace. So what did I do? 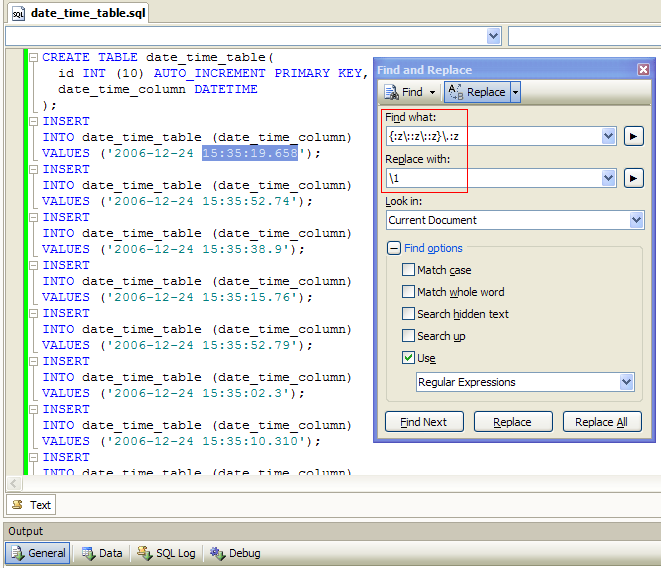 I completed this task using dbForge Studio for MySQL and regular expressions. Regular expressions provide a concise and flexible means for identifying strings of text of interest, such as particular characters, words, or patterns of characters. 1. 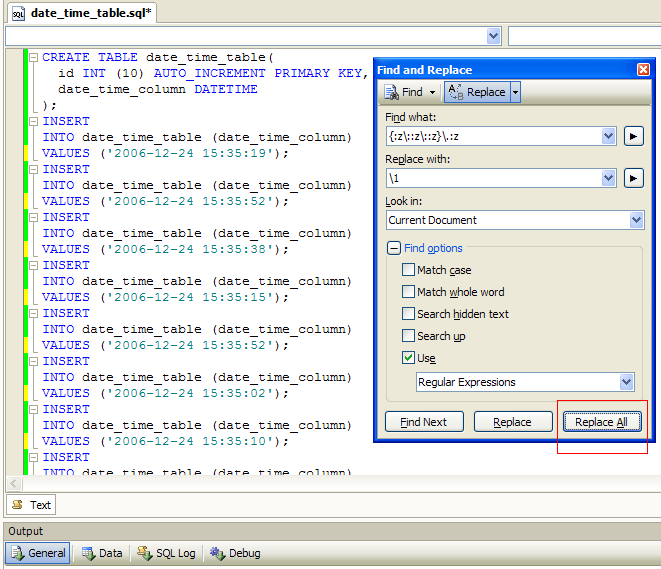 In the top menu of dbForge Studio for MySQL open the Find and Replace window. 2. 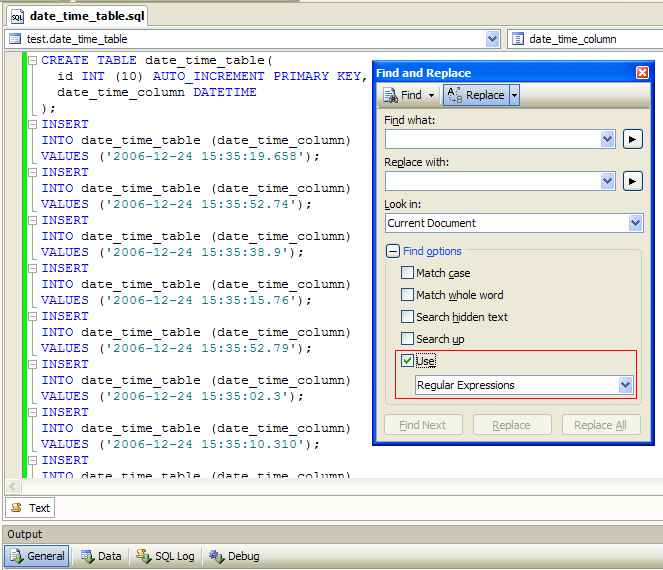 Tick the Use check box and select Regular Expressions, so the program will use them while finding and replacing the data. What do the entered symbols mean for the program? The program will search dates matching the specified pattern, i.e., it will replace dates in ‘hour:min:sec.msec’ format with ‘hour:min:sec’ one, truncating milliseconds. 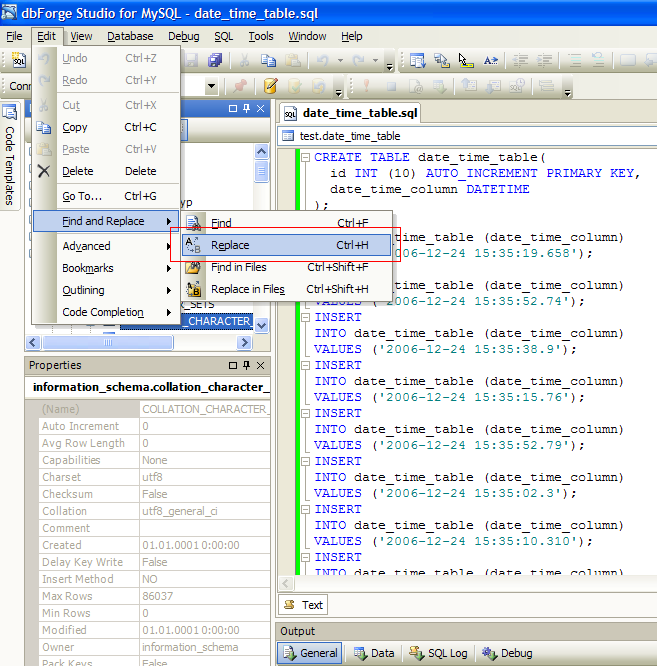 The same technique can be used to import data, while ALTERing tables from MyISAM to InnoDB, etc. When data is imported, it is already in correct format. I assume the above code needs some tuning; it’s just an example. But this approach will increase the script size and decrease readability, which is undesirable for the scripts kept in a version control system.